Kristin Silbereisen will have the chance to defend her Women's Singles title at the German National Championships, after she saw off Wan Yuan (7-11, 11-5, 11-8, 11-5, 11-4) on Saturday 4th March to move into the semi-finals of the 2017 edition of the tournament being hosted in Bamberg. Victory for Kristin Silbereisen means that the 31-year-old player has kept her name in the battle for the trophy, as she aims not only to defend her title won at the 2016 tournament but also to claim her third triumph in the category having also succeeded at the 2010 German Championships. Despite falling a game behind in her quarter-final tie against Wan Yuan, the result never looked in any real doubt for Kristin Silbereisen, who put in a calm display to set up a last four encounter with Tanja Krämer. Arguably the standout competitor in the quarter-finals of the category, Tanja Krämer held off a late comeback attempt from Chantal Mantz to put her name into the semi-finals (13-11, 11-8, 11-9, 7-11, 7-11, 5-11, 11-8) and will be hoping to register a similar outcome on the final day in Bamberg. Shan Xiaona is the top seeded player in the Women’s Singles draw and heads into the closing day having only dropped a single game so far in the category. Success in four ends over Kathrin Mühlbach (11-8, 11-3, 11-6, 11-7) has sent Shan Xiaona into the last four, where she will meet Katharina Michajlova following her triumph against Julia Kaim (13-11, 11-7, 11-6, 11-7). Ruwen Filus managed to edge his way into the semi-finals of the Men’s Singles tournament in Bamberg, following his seven game thriller against Kilian Ort. In an end-to-end battle Ruwen Filus didn’t get off to the strongest of starts in the match as Kilian Ort claimed the opening two games, but the 29-year-old soon brought the tie level at two games apiece. Kilian Ort took the lead once again with his capture of the fifth game, however, it was to be Ruwen Filus who would progress as he stole back-to-back ends to seal the win (7-11, 4-11, 11-3, 11-4, 8-11, 11-9, 11-4). 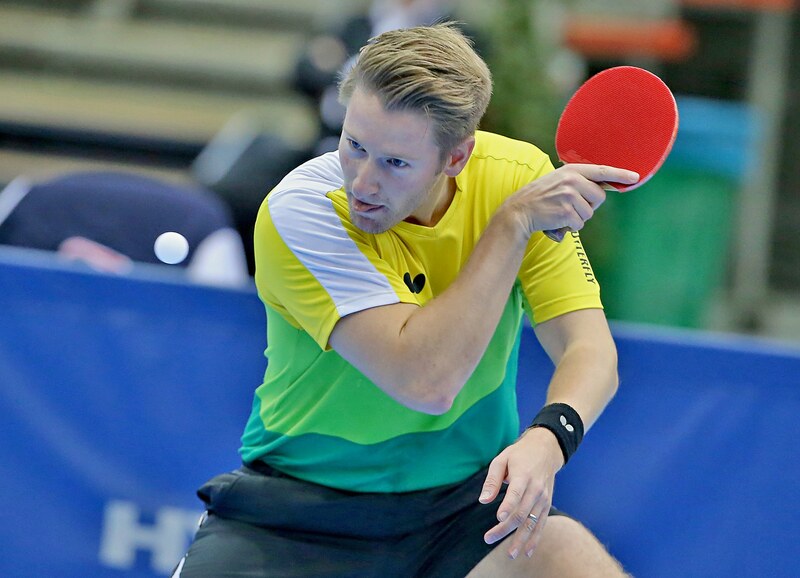 Last year at the German Championships Ruwen Filus partnered up with Ricardo Walther to claim the Men’s Doubles trophy. Fast forward a year and both players could potentially fight it out for the chance to win the Men’s Singles at the 2017 tournament after both competitors were kept in separate halves of the semi-final draw. Ricardo Walther booked his spot in the last four with a 4-1 triumph over Gianluca Walther (12-10, 11-7, 12-10, 9-11, 11-8) and will take on the ten-time champion Timo Boll in the next match. Benedikt Duda will be the next opponent for Ruwen Filus.